Barcelo, J.; Ferrer, J.; Lídia Montero; Perarnau, J. 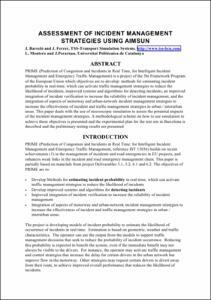 PRIME (Prediction of Congestion and Incidents in Real Time, for Intelligent Incident Management and Emergency Traffic Management) is a project of the 5ht Framework Program of the European Union which objectives are to develop: methods for estimating incident probability in real-time, which can activate traffic management strategies to reduce the likelihood of incidents, improved systems and algorithms for detecting incidents, an improved integration of incident verification to increase the reliability of incident management, and the integration of aspects of motorway and urban-network incident management strategies to increase the effectiveness of incident and traffic management strategies in urban / interurban areas. This paper deals with the use of microscopic simulation to assess the potential impacts of the incident management strategies. A methodological scheme on how to use simulation to achieve these objectives is presented and the experimental plan for the test site in Barcelona is described and the preliminary testing results are presented. Barcelo, J. [et al.]. Assessment of incident management strategies using aimsun. A: World Congress on Intelligent Transport Systems. "Full conference proceedings available on CD-ROM". SYDNEY: 2001, p. 1-14.